Helps regulate sleep habits by naturally promoting drowsiness. Good for those with jet lag, who work night shifts, are exposed to artificial light at night, or who suffer with anxiety. <:p> Needs vary significantly from one person to another. 2.5-3mg is generally enough to promote sleep. If waking up the next morning becomes difficult, then this dose may be a little high. If, on the other hand, you do not sleep for long enough, the dose may be increased. The sublingual form is particularly suitable for quickly countering the effects of time differences, while the slow-release form is better for night/early morning wakefulness. Melatonin should always be taken at night. If taken in the daytime, it may cause drowsiness or dozing and a lack of coordination. 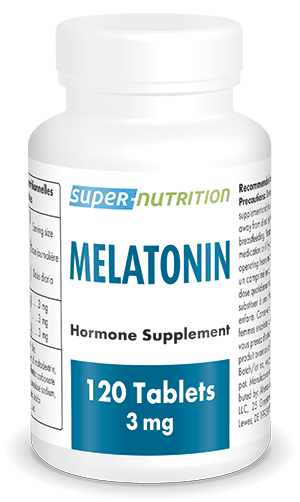 Unlike sleeping pills, melatonin - taken at the right dose - rapidly promotes natural, restorative sleep which resynchronises the circadian rhythm. It does not lead to addiction or dependency. Sleeping pills, on the other hand, suppress the sleep phase devoted to dreaming (REM), require increasingly high doses and gradually lead to heavy dependency. With melatonin, you will wake up fresh and alert; with sleeping pills, waking up becomes difficult, as if you have a hangover.